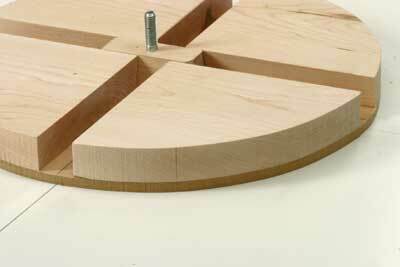 There are all sorts of ways to cut an ellipse but the easiest way to get a perfect shape is to use a router jig of some sort. 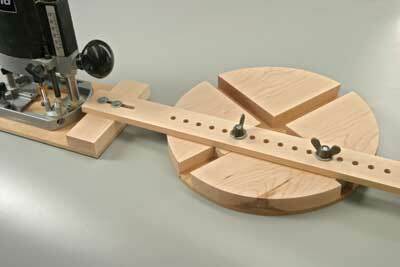 This ellipse jig is not original, I have seen variations of it in several books, but it is very easy to make and works a treat. If you substitute the central pivot base for a single pin you can then use the arm as a large trammel for circle cutting as well. A true oval obviously doesn't have a constant radius. The radius is greater along the main axis of the oval and smallest along the minor axis, (see drawing). Ovals actually have two pivot points and it is this feature that is utilised in this jig, the trammel beam pivots about the two points simultaneously. You need very little in the way of materials; the only requirement is that the main beam must be strong and rigid so I cut this from an offcut of maple, ripping it down to 3/8" thick, Pic 1. You need to drill a series of holes along the middle of the bar, I spaced them at 3/4" centres using a very simple repetition jig on the drill press that ensures accurate and even spacing, Pic 2. 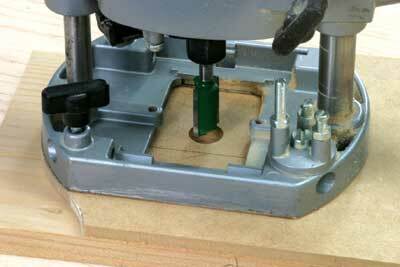 For the router platform I used a piece of 6mm MDF screwed onto the router base with two countersunk bolts. Make the platform a little oversized to start with, then once the router is fixed in place do a bit of cosmetic shaping to make it look a bit more professional. 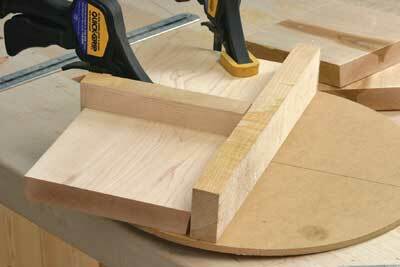 Use a straight two-flute cutter to plunge through the base and provide the working aperture, Pic 3. To give some wear resistance and make the thing slide round a bit more easily I covered the base of the platform with some laminate, sticking this on with contact adhesive and then trimming it back with a bearing guided cutter, Pic 4. 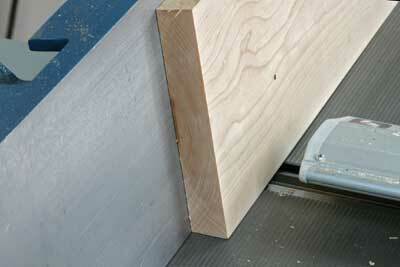 Screw a 3/4" thick block of wood onto one end of the platform as a fixing point for the main beam, Pic 5. The beam itself needs a narrow slot routing in one end to provide fine adjustment for the radius if the hole spacing on the beam isn't quite suitable. Two screws with washers through this slot will hold the beam tight to the platform but allow for this adjustment if need be, Pic 6. The finished router platform is shown in picture 7, I use a small router for this type of work but the beam and platform are quite strong enough if you have more ambitious plans with a heavy-duty model. 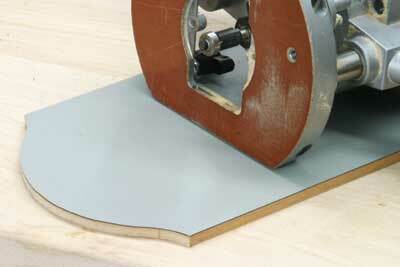 The pivot base is equally simple to construct and again you can use up all sorts of offcuts for material. 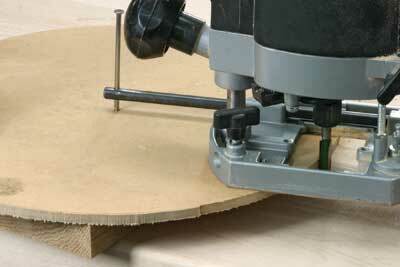 The main base is another piece of 6MM MDF cut to a circle with the router using a trammel. 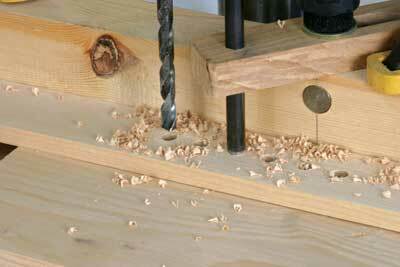 In fact all I use is one of the fence guide bars with a hole drilled in one end through which I insert a fine nail. 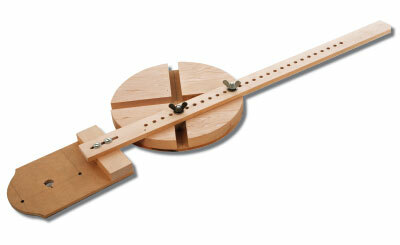 Hammer this in to the middle of your disc and just whiz the router round for a perfect circle, Pic 8. The guide segments for the pivot base are again maple, anything fine grained will do, as you will need to get a smooth polished finish on it. 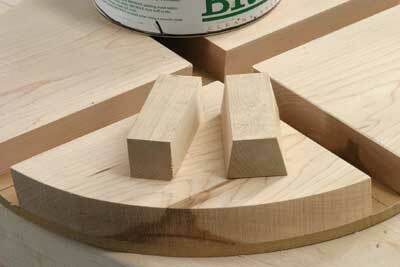 I decided to make the channel in one of the axes of the base dovetailed to prevent the beam falling out. I did debate whether to make them both dovetailed but this would have entailed a disproportionate amount more work and the single angled slot has since proved to be fine. In fact I think the action would not have been as easy if both slots were angled. 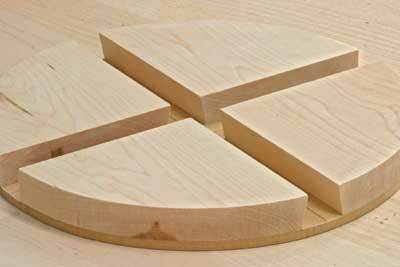 Plane the material for the guide segments at a 10 degree angle, Pic 9, and then cut it into four equal squares. The two grooves must be at right angles to each other so draw these out on the MDF base as a reference, then glue on the first two blocks using thicknessed spacers to maintain the groove, Pic 10. 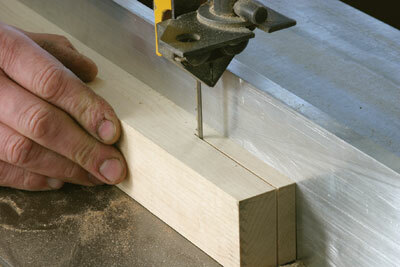 Repeat the procedure for the other two blocks, and then trim the excess back to the original MDF circle, Pic 11. The sliding pivot blocks are cut to be a snug sliding fit in the grooves, obviously one is angled and the other square, Pic 12. 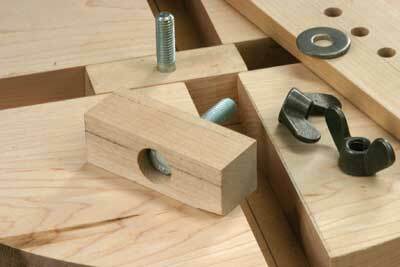 Use some wax polish on both the blocks and the grooves to get them sliding really smoothly. Drill a bolt hole through the centre of each block countersinking the head so that it won't affect the sliding action, Pic 13. The main beam is attached to these pivots with wing nuts and washers, but don't over tighten the nuts or it will not swing easily, Pic 14. 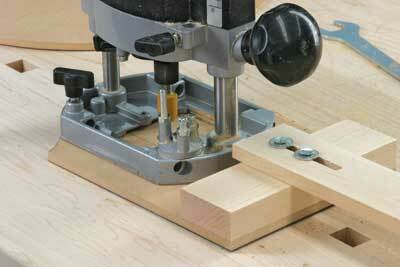 The action of the finished jig is remarkably smooth. Try it a few times with the router in place, you may need to make minor adjustments to the length of the pivot blocks so they don't block each other when they cross over in the centre of the jig as you swing the beam right round, Pic 15. 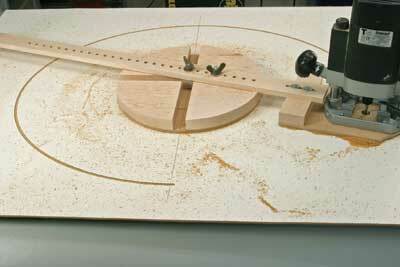 You need to know the overall length of both axes of the finished ellipse and then mark these out on the workpiece. Fix the centre of the pivot base on the intersection of these two axes and use the lines on the centre of each slot as a guide to line up one slot with the main axis and the other slot with the minor axis, Pic 16. A couple of short lengths of double sided tape will get it firm enough, but do press it in place really hard to get the tape to grip firmly. 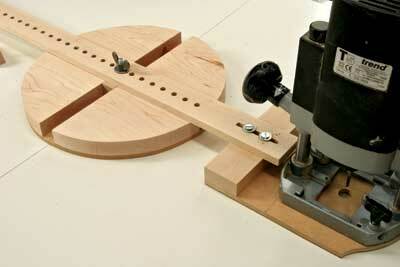 Now line up the beam with the major axis and position the router bit so that it is on the marked diameter. 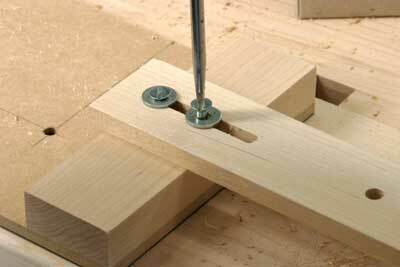 Centre the pivot that slides along the minor axis and bolt it to the beam, Pic 17. Swing the beam round 90 degrees lining it up with the minor axis and positioning the router bit at the smaller radius of the ellipse. Centre the other pivot and fasten the beam to it in this position, Pic 18. 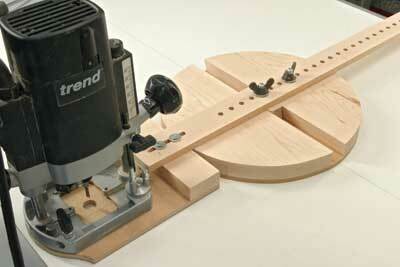 Swing the router round at this setting to make sure it passes through the four extreme points of the ellipse. Now start taking shallow cuts to form the ellipse, applying a small amount of outward pressure on the router to take up any play in the blocks as they slide around, Pic 19. 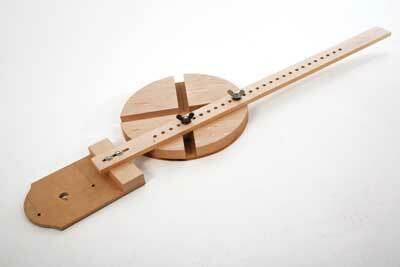 As ellipses vary enormously in proportion you may find that this jig will not cope with all sizes. 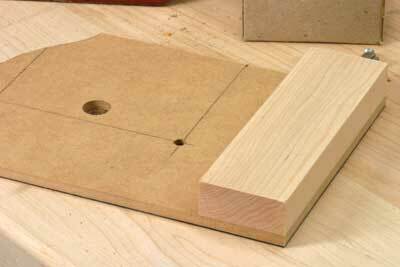 The key feature is the difference between the main and minor axes, which in the case of this jig must be no more than about 12". For extreme sizes you may need to make a different sized pivot base. 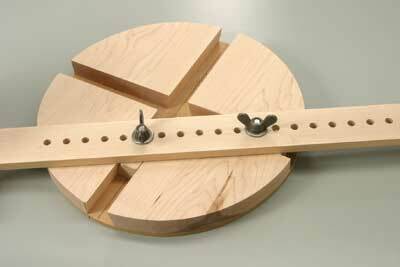 "Ovals actually have two pivot points and it is this feature that is utilised in this jig"